It’s little known, but we have been able to search by skill from a personal account for a while now -not in the main search dialog, but in the “Field of Study Explorer“. If we know what college major we are looking for in our prospects, we can change it and search for skills. Try the same search as above using your personal account – major = computer Science, location = San Francisco Bay Area, company = Google OR Apple OR Facebook OR Yahoo OR LinkedIn OR IBM. (Note: To do so, you will need some sort of a premium personal account; unfortunately, it seems, the skill selection is no longer displayed when searching in the Field of Study Explorer from a basic account. I don’t think it’s documented). Just as in Recruiter, this is an OR search for skills. 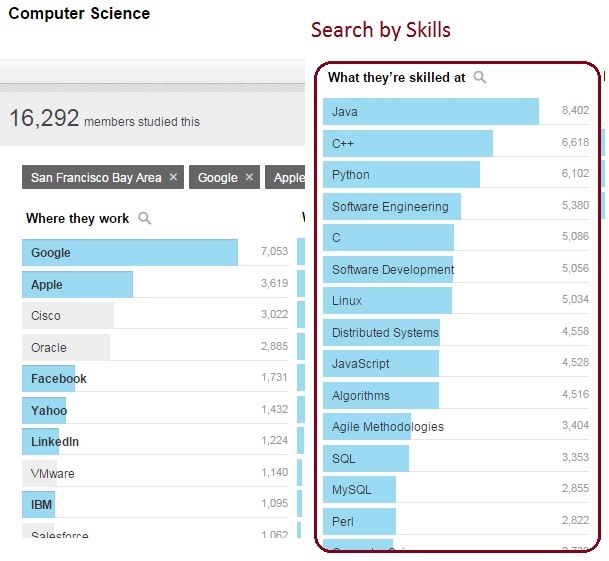 As an example, you can search for skills= Python OR Perl OR PHP. Conclusion: Got a college major, will search by skills. Want to figure out other productive ways to search? Sign up for the last webinar in 2015 – Boolean Search on LinkedIn – December 16, Wed, 2015, with an optional Practice hands-on session on Thursday. I’ve been doing something similar where I put the desired skill in the keywords search box in Linkedin Recruiter. 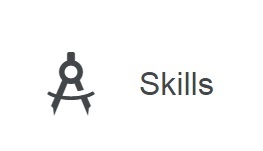 After getting my search results, I find the skill in the skills list and put a check next to that skill. I then remove the skill from the keywords search box and search again. Voila! I find all the profiles that have that particular skill in the Skills and Expertise area but don’t necessarily mention it in their profile. 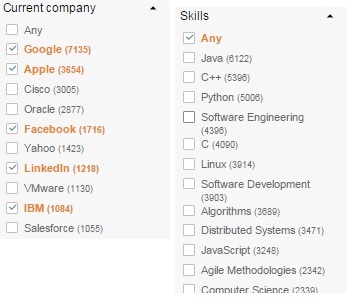 Yes, correct, they have added the skill search to Recruiter about a month and 1/2 ago. Somehow it’s not in the initial people search dialog, but once you have searched for anything (not necessarily skill keywords), you get access to the skill selection for searching. You can enter a skill to search for as well. Irina; Interesting, when I clicked your link for Field of Study Explorer- it opened to the the psychology with related contacts, within a Basic Account. Without your link, however, I’m unable to find the function. I was wondering if it might work in a Basic account as your link worked. Unable to locate through search or otherwise- how to reach the Field of Study page. I’m familiar with sourcing using university pages- but just seeking a specific degree as part of a profile. Any clues on how to find that function on LI? thank you. You should see the Field of Study Explorer at this link – https://www.linkedin.com/edu/fos. This all assumes that the person you’re searching on actually added skills to their profile, does it not? Hi Irina, thanks so much for the article. Where exactly do I insert the string “major = computer Science, location = San Francisco Bay Area, company = Google OR Apple OR Facebook OR Yahoo OR LinkedIn OR IBM”? Or is this string that you created a breakdown of the filters? If so, I cannot seem to find where to input major = computer science? Alex, just click on the link in the article.